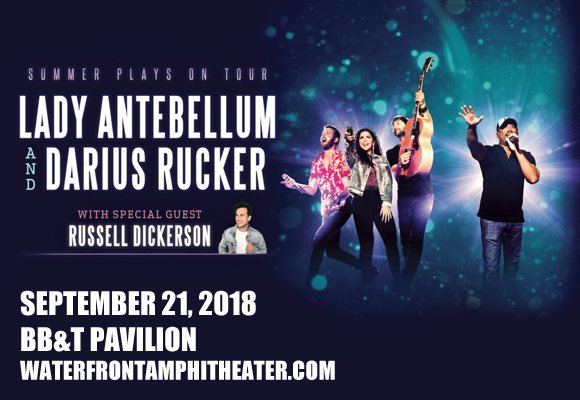 Bringing the sunshine and a healthy dose of world-class country music, Grammy Award-winning country acts Lady Antebellum and Darius Rucker have teamed up for the Summer Plays On Tour! Coming to BB&T Pavilion on Friday 21st September 2018, these incredible artists, who previously paired up on Rucker's 2013 Grammy Award-winning hit "Wagon Wheel", will be performing headlining sets with support from rising star Russell Dickerson! "Reuniting this summer and heading back out on the road with my friends Lady Antebellum feels like a home away from home,” said Rucker about the tour. Darius Rucker began his career in the late 1980s, rising to fame as frontman of Hootie and the Blowfish. The band's debut album Cracked Rear View (1994) was certified sixteen-times platinum by the RIAA, becoming the best-selling album of 1995 and one of the fast-selling debut albums of all time. Rucker released his debut solo album, the neo-soul tinged Back to Then, in 1992, but later turned to country music, signing to Capitol Nashville in 2008. Later that year, Rucker released his country debut, Learn To Live, which launched the number one single "Don't Think I Don't Think About It", making him the first black artist to reach number one on the Hot Country Songs charts since 1983. To date, Rucker has released six country albums, and his 2013 cover of “Wagon Wheel” won him the Grammy Award for Best Country Solo Performance at the 56th Annual Grammy Awards.